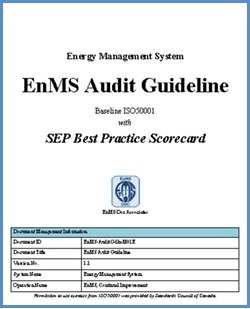 This is an EnMS template guidebook document designed to create a management document “EnMS Audit Guideline”, one of the most important guideline documents in energy management operation, a systematic, independent and documented process for obtaining evidence (records, statements of fact or other information) and aim to evaluating it objectively to determine the extent to which the audit criteria (set of policies, procedures or requirements) are fulfilled as well as to assess achieving energy performance improvement. It is one of the first energy management system audit guideline to assess energy performance improvement as well as operational performance. 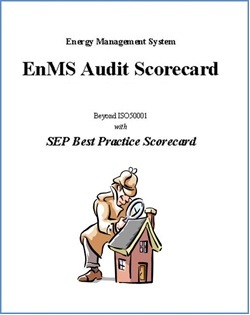 The “EnMS Audit Guideline” in this document defines the managerial guideline and provisions for the auditing process for the energy management operation and energy performance improvement, utilising audit scorecard system for quantitative assessment. For conducting EnMS audit, EnMS Audit Scorecard was developed to demonstrate quantitative, clear-cut and transparent assessment by auditors and performance verifiers. The scorecard uses Microsoft excel sheets to consolidate assessed data that eventually transform to rating of a scale of 0 to 100% or 0 to 100 points. In order to standardise the scoring criteria, the scorecard set comes with an user’s guide for ensuring users to benefit from the scorecard. The scorecard is delivered with a model version, the assessment of virtual organisation, so the scorecard users are provided with typical audit question statements per requirement that are very useful reference. Purpose of this presentation is to provide a summary of "EnMS Charter", the highest level document in EnMS. 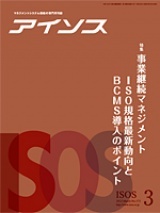 The Japanese monthly magazine "ISOS" is a well-known ISO dedicated publication to provide latest ISO related information on activities, studies, and developments in Japanese. In the March edition of "ISOS", the interview article with an U.S.A. ISO/TC242 expert provided a very clear picture about SEP and its programs currently being promoted by USCEEM and DOE in the U.S.A. This article should stimulate Japanese readers who are struggling in tackling with ISO 50001 international standard with some new ideas given by the SEP program. We believe it is also a good reference to those who are not yet familiar with SEP program, and therefore would like to introduce summary of the message coming from the article. The expsert urges Japanese industries to adopt ISO 50001 which is a beneficial tool to enhance Japan's leading role in energy saving technology through energy management aspects in the global scene. The part that will generate ISO 50001 awareness in Japan is where the expert speaks about SEP's drive to improve energy performance improvement and the certification part should come with the performance. He elaborated this from the perspective of both ISO and SEP positions "when implementing ISO 50001, there is an option for energy users to self-declare conformance". EnMS-Doc is putting a high value on the fact that through the SEP effort, the U.S. government is addressing energy management operation as a priority and focal point for the industrial sector to build up competitive advantage in the global scene. EnMS-Doc will continue to follow SEP updates and plan to provide timely key information to our visitors. 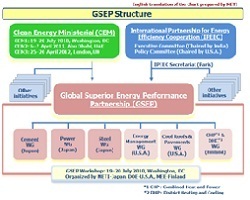 In the article, the expert also introduced briefly about GSEP by stating "During the Clean Energy Ministerial (CEM) took place in July 2010, Global Superior Energy Performance Partnership (GSEP) was founded as an Japan-U.S.A. initiative related to energy conservation (refer to the chart on the right prepared by METI, Japan). In GSEP, there are 6 ongoing working groups (WG), and 3 WGs (Cement, Power, Steal) chaired by Japan, 2 WG (EnMS certification, Cool Roofs and Pavements) chaired by the U.S.A. and 1 WG (Combined Heat and Power and Efficient District Heating and Cooling) chaired Finland. The WG are liaised with METI for Japan, DOE for the U.S.A. and Ministry of Employment and the Economy for Finland." 22-23 March 2012 Seoul, Korea "GSEP Energy Management Working Group Meeting"
25-26 April 2012 London, UK "Clean Energy Ministerial 3 (CEM3)"
In the same March edition of "ISOS" also features "Business Continuity Management: The latest ISO standard trend and key elements to adopt BSMS". When observing the BSMS, you will appreciate very much that "Energy Management" and "Business Continuity" are linked by fate. "Business Continuity" is a globally hot topics today because from the recent global experiences, people are realising that "without energy you cannot sustain the business". Once you are adopting ISO 50001 based energy management operation, automatically you are advancing to manage the business continuity aspects. The 12 management documents that are offered from our menu pages designed to ensure ISO 50001 compatible energy management operation are receiving very favourable review for their nature of coherency in guiding towards business continuity management.